Please note: You will need to book an appointment if you want to come into the studio to discuss a cake design/order. Due to hygiene reasons I cannot accept anyone without an appointment. 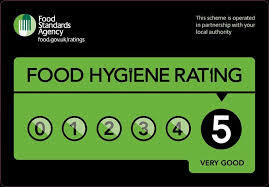 We are fully registered with Rochdale Council and have a Hygiene rating of 5. We also have Level 2 award in Food Safety for catering along with full Public Liabilty Insurance.